Note also that 17 year-olds can register to vote and even vote in the May primary as a 17-year-old if they will by 18 on or before November 5 (Election Day). Whereas people with felonies in their past have their right to vote taken from them in Kentucky (unless they get a pardon from the governor), people with misdemeanors in their past or people who are pre-trial in jails do have the right to register and vote. 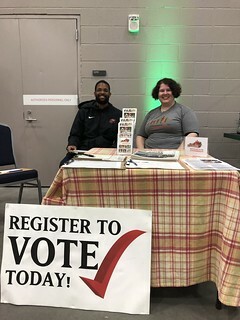 If you’d like to get involved with registering voters, please reach out to your local chapter to join tabling and canvassing events, fill out the volunteer form here, and/or visit our Action for Democracy Toolkit to learn how you can register voters yourself! We’ve planned 36 door-to-door canvasses and 41 events leading up to the primary election to register, educate, and mobilize voters and it would be all the better with your help.